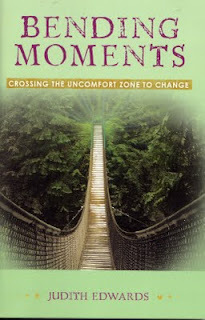 Local author Judith Edwards will discuss her new book, Bending Moments: Crossing the Uncomfort Zone to Change. Judith is a clinical social worker in private practice for sixteen years. She has traveled nationwide with her workshops, seminars and lectures on such topics as Healing in Beautiful Places, Shaping a Personal Life in the Age of the Microchip and Changing the Frozen Narrative.